The families after examining the compatibility of the couples both physical andmental and the longevity of their wedded life from the horoscopes initiate the marriage negotiations. This consists of enquiring about the background of thebride's and groom's families and a visit of the groom and family to the bride'shouse. Once the groom and bride like each other both families decide to perform the marriage. 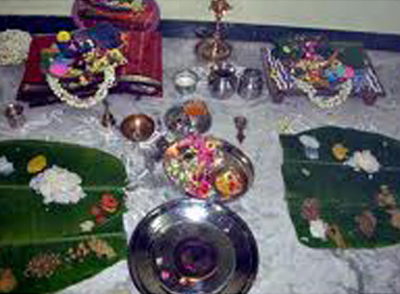 A simple ceremony which was preceded by a Vigneswara pooja and exchange of Nalikera and Thamboola (Coconut, betel leaf and arecanut) before elderly people of both families, by the brides and grooms parents is called Vaang Nischaya, Later the reading of Lagna Patrika (or a contract by both parents about the performance of the marriage) was added to this simple function. But this has now become a mini marriage ceremony, which is celebrated in the groom's house. Apart from what is described in the last paragraph, mutual garlanding of the groom by the bride and a big feast for large number of invited guests etc form a part of this function. This is a prayer by the groom's and bride's families to those ladies of their family who have died as sumangalis. i.e. died before their husbands. The blessings of these sumangalis are sought by inviting 5-8 Sumangalis for a special pooja and a traditional feast. Normally the married daughters and sisters of the family are included in the list of invitees. 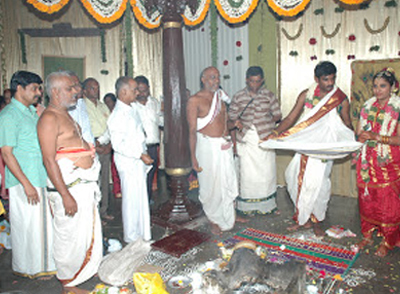 All Sumangalis come to the feast in a traditional attire of a nine-yard sari. Apart from Sumangalis akanya is also invited. There is lot of variation of this pooja, which almost differs from family to family. No priest is called and no Sanskrit sloka is recited. It is a custom in certain families to hold it after the marriage so that the daughter or daughter-in –law participates as a Sumangali in this Pooja. 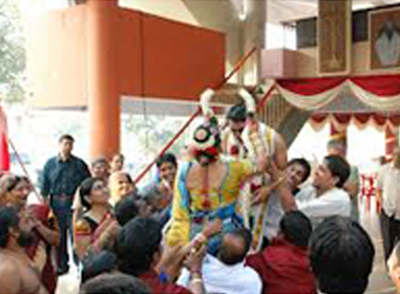 The groom's party is taken to their place of stay and is received in front of the mantap by thebride's parents and relatives. They are received besides the usual coconut, flowers and Thamboola with two conical structures called " Paruppu Thengai Kutti". This is a very important function of the iyer marriage. In the present day it consists of getting dressed in western clothes by the groom at the nearby temple and from there coming to the mantap in a grand procession to accept the bride. The bride's brother presents the dresses for the occasion to the groom before the januvasam and arrangements are made to take them to a predetermined temple. A special Pooja of the deity is also arranged It also is an indirect exposure of the groom to the general public.The procession nowadays is in a car preceded by a grand nadaswaram and some times bursting of crackers. In the olden days the procession used to be even on elephants. This is an important item of the marriage ritual and is normally held in the previous evening to the marriage and after the Janu Vasam.This consists of a preliminary Ganapathi Pooja followed by honouring the parents of the Groom by the parents of the bride and vice versa and announcing the final agreement by the bride's parents that they are willing to give their daughter in marriage to this groom. The groom and his parents accept the proposal . The groom's parents give her a silk sari during this time. She receives this and changes whatever sari she wears with the new one. 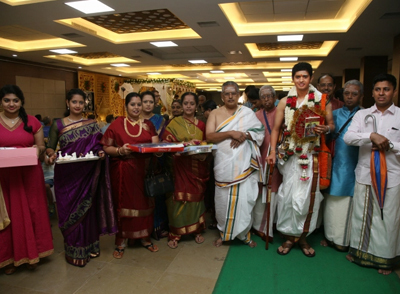 In this function elders from both families meet each other and bless the groom and the bride for a happy future. There is also a custom of giving articles for washing and make up as well as two dolls by the groom's party to the bride during this occasion. It is called for Vilayadal or playing. This is supposed to be given by the groom's sister. Sometimes along with this she also presents a silk sari. As mentioned under Januvasam, the groom is still a brhamacharin in the ascetic garb. He is unshaved, uncut and supposed to lead a strict life as prescribed. His Guru when he was initiated in this life of penance is his father. So it is essential that before he gets married he has to take permission from his father (Guru) to end his Brhama Charya Vritha and marry and lead a life of a Grihastha.This function is Vritham. 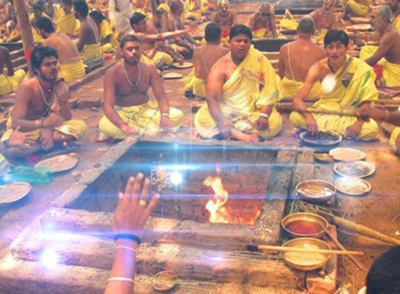 During this time the groom's father makes him perform all the samskaras like namakaranam, Choulam, Annaprasanam etc which for some reason have not been performed and also make the groom do the duties as a brahmacharin which he has not performed like Khanda rishi tharpanam, Prajapatyam, Saumyam, Agneyam, Vaiswadevam etc and complete the samavarthana(life of a brhma charin). It is necessary according to religious beliefs that he has gained expertise in Vedas by this time. 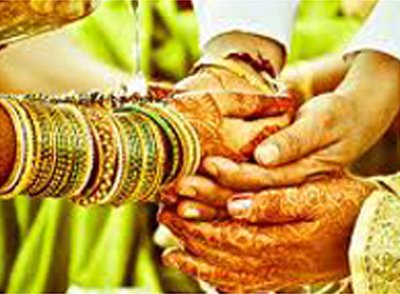 Simultaneously a Raksha (Protection) in the form of a sacred string is tied in the wrist of the bride after reciting Vedic manthras to protect her from all evil spirits. Pali means row of trees and this ritual would have been planting of trees by the groom's and bride's families for the upkeep and happiness of the groom and the bride. 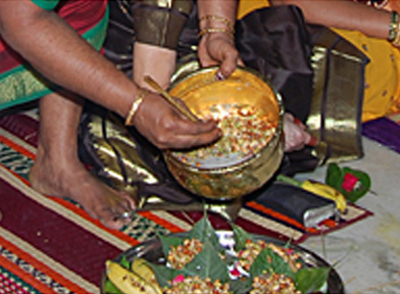 In modern days, this consists of sowing germinated seeds of nine kinds of presoaked cereals in 5 mud pots (layered with green grass and bilva leaves) by married women (Sumangalis) relatives of the groom and the bride. They first sow the germinated seeds and pour milk with water over it. It is a custom nowadays to have five such pots for each side. Five sumangalis (three from the groom's relatives and two from the bride's relatives in case of the groom's side and three from the bride's relatives and two from the bride's side in case of bride's side) sow the germinated grain and pray for long happy married life for the couple as well as several children to brighten their homes. After the Vritham in the olden days the groom used to have a haircut and a bath. This is in memory of those times when he used to grow hair during the time when he was a brhmachari. Slowly this custom vanished. Nowdays after the Vritham the groom wears for the first time in his life the 8 yards Dhoti called Soman in the Pancha Kacham (which incidentally means big Veshti one part of which goes in between the legs) fashion. He also wears an Uttariyam.It is normal for him to carry a fan, an umbrella, a bamboo fan, a grantham (any book nowadays), wear new slippers and also a small bundle .He wears (collyrium) Kan Mai, garland and sees himself for the first time in the mirror after the poonal. He also wears double poonal (sacred string) indicating the fact that he is ready to become a grihastha. He usually walks away from the marriage Pandal and is stopped by the father of the bride .The groom informs the bride's father that he is going to Kasi. (Which indicates that he is still learning and is going further to learn). 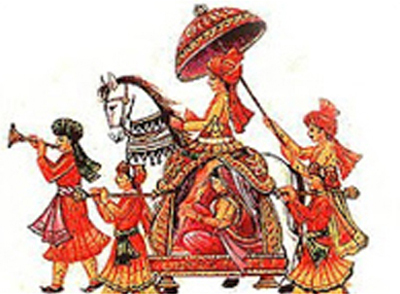 The bride's father first tells them that he is already an accocmplished Vedic Scholar and requests him to stop his travel for learning and offers him a coconut and offers his daughter in marriage to him and requests him to come back and become a grihastha. The groom accepts this request. This is not a Vedic ritual as no manthras are uttered. This is another very interesting ritual, which is not Vedic and entirely managed by women relatives. This is also called Kannujal.The silk Sari to be worn by the bride during this occasion was supposed to be purchased by her maternal uncle. The bride keeps her fingers folded in to the palm in a conical form and the groom holds her hand (It is interesting to note that the Pani Grihanam which means holding of hand, which is a Vedic ritual takes place much later after the oonchal. Hence some elders feel that Oonchal ceremony should not be held at this time). The groom leads the bride in front of the Oonchal (A swing) and they stand together facing east, Then the mother of the bride, mother of the groom, paternal aunts of the bride and the groom and one of the uncles wife's or maternal aunts (altogether five people in some families seven people) one by one sprinkle milk on the feet of the groom and bride (symbolizing washing their feet with milk) and wipe their feet with the edges of their silk sari. 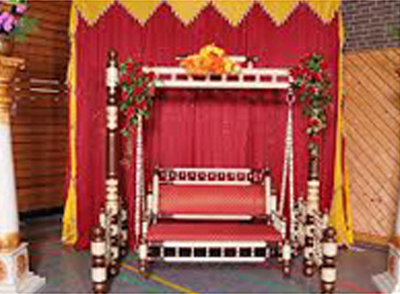 After this function the groom and bride are asked to sit in the swing, ( It is told that the bride's feet should not touch the ground and only the groom's feet should touch the ground while sitting in the swing, symbolizing that He is the controller of the family) the same relatives then wave colured rice balls (normally coloured red but in some cases coloured yellow and red) all round them in a circular motion and throw them in different directions. This is a ceremony meant to ward off evil from the groom and bride. After this the same relatives give a mixture of sugar, milk and banana to the bride and groom. Once this is over the bride's paternal aunt walks round the swing with a lamp kept on a plate and lit on cooked rice, fed by ghee and with five wicks kept on a brass plate called Thambala .She is followed by the bride's mother, grooms mother, grooms paternal aunt, brides or grooms uncle's wife alternatively carrying a pot of water and a lit lamp normally kept in a vessel. (So that wind does not put it off). While all these is going on the women invitees sing mellifluous tunes composed by several poets for the occasion. The priest waves a coconut round the bride and groom and breaks the coconut. This is really an announcement about whom the bride is going to wed and whom the groom is to the people who have gathered there. The gothra to which the bride belongs, name of her paternal great grand father, her paternal grand father and her father are repeated in a sonorous loud tones by one priest. They ask the bride's father whether he agrees to protect the dharma of his family. He agrees. Then another priest similarly introduces the bridegroom by telling his Gothra, names of his paternal great grand father, paternal grand father and father. The groom Okays the information given and agrees for the marriage ceremonies. This is repeated thrice. 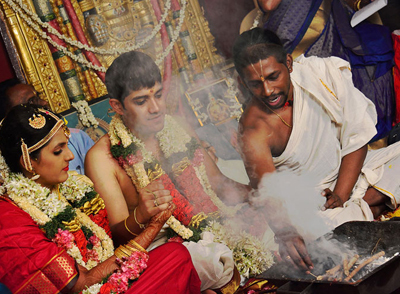 The Hindus consider gifting of their daughter to a suitable groom as a very holy deed. In fact it is supposed to be superior to many other holy deeds like giving alms, giving food etc. In the beginning of this ritual the bride would be sitting facing east on a bundle made of paddy stalks and holds in her hand a coconut. She also holds a small gold coin called Pudu panam. (But nowadays, she sits on the lap of her father. ).Her father should stand facing north with the brides mother on his right side. The groom stands facing the west.. 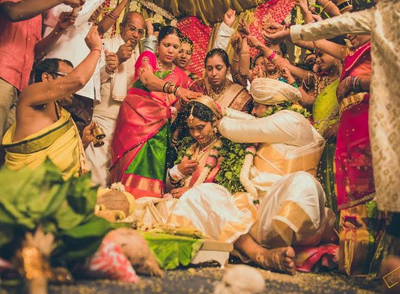 The father of the bride holds the Thamboola (Betel leaf and areca nut) in his palms and the bride should place her palms holding coconut on her father's palms. The groom should join his palms and get prepared to receive the bride's palm holding coconut from her father. 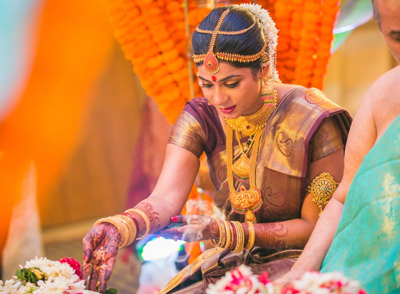 While her palms are being transferred, the bride's mother should keep on pouring water over her daughter's hand, which should made to fall on the ground (This is called Dhara in Sanskrit. In Tamil this ceremony is called Dharai Varthu Kodukkal). Gently the bride's palms are transferred to the groom's hand. 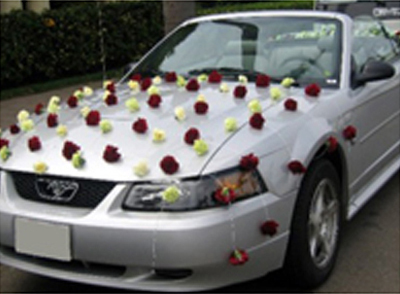 This ritual symbolizes the transfer of ownership of the bride to the groom. This means raising of fire. Fire has been the basis of modern life. For centuries the only method of raising the fire was by churning wood. (since there was no match box).Due to it being extremely essential in day to day life, a married man was supposed to maintain fire perennially in his house with the help of his wife. This is a Oupasana .He daily remove the ashes surrounding the fire worships the fire and maintains it. 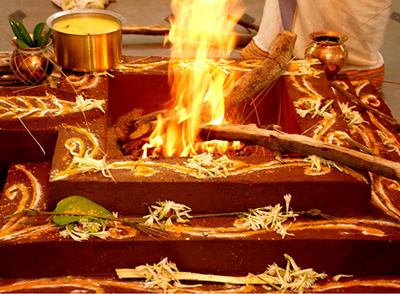 During this holy ritual a new fire is supposed to be raised by the groom with the help of the priest .He is supposed to take a part of this fire and maintain it in his home for life. Once the bride's father gives away his daughter to the groom and he accepts her, the bride's father becomes happy and again does honours to the groom by washing his feet and then offering him a mixture of honey and curd called Madhu Parkam.He also is supposed to give him a cow (the basis of a happy home in earlier times. In fact wealth was counted by the number of cows one has). Nowadays cow is substituted by token presents. While the bride's father washes his feet, the groom prays, " Let this water poured over my feet destroy my enemies and take care of my family. The bride's father then tells the groom" You who are the personification of Maha Vishnu, please take your seat and accept all these good things that I give you" After this the mixture of curds, honey and ghee is given to the groom. In some families they also add popped rice and fried rice flour. The groom tells the following prayers: - Hey, God of Knowledge, who is responsible for the gleam in people in general and the lustrous strength of Brahmins, Hey Vedas who add luster to the God of Knowledge, Hey Vedas who are themselves the strength of all, I pray you to make all people love me like this, please make me own several herds of cattle. Hey Madhu Parka, which has come to me, please give me luster, fame and milk like qualities. Let all people love me. Please give me cattle wealth. YThis is a ritual, which symbolizes, announcing to everybody his intention of marrying the maid who has been given to him. He looks at her part by part and talks to her and requests her to become a part of his family. First he prays to the Gods thus:- Hey, Varuna, Let not anything bad befall on the sibs of my bride. Hey, Brahaspathi, please remove all bad physical and mental qualities in her. Hey, Indra please remove all the physical barriers in her that would prevent birth of children and also equip her with good qualities so that she can bring up the children properly. Oh, All Gods, please shower her with all good qualities. Mangalya means that which gives good things and Dharanam means "wearing". 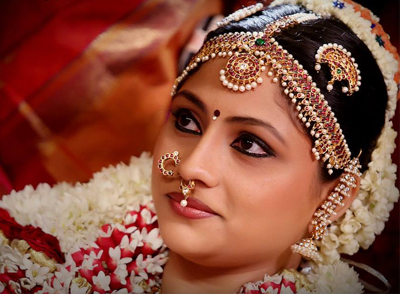 The bride has to wear two mangalyas one given by her father and another by the groom's father.The shape and content of Mangalya varies from family to family. Normally before marriage the gold for making mangalya is melted on an auspicious day by the gold smith. Lot of importance is given in the present day to the Mangalya. 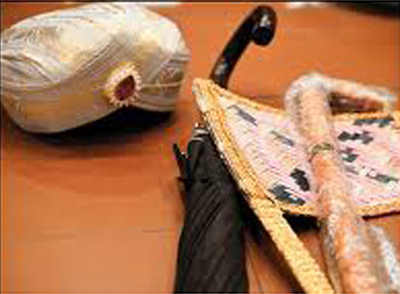 Before being tied it is circulated among the audience for their blessing and good wishes. This mangalya is a piece of gold in which is inscribed Shiva Linga or Shiva Linga as embossed on a Thulasi madam or Goddess Meenakshi depending on the custom of the bridegroom's family. The groom ties the mangalya arranged on a yellow string round the neck of the girl only the first knot is put by him and two more knots are put by his sister. (The groom's sister is normally given a suitable present for tying the two knots). The bride is normally sits facing east and sits on her father's laps. 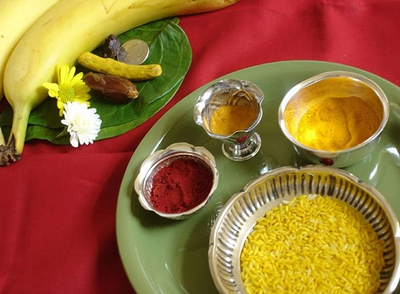 After the mangalya Dharanam is over, the elders shower flowers and yellow coloured rice on the groom and bride. It is also common nowadays to congratulate the bride's parents and groom's parents after this ritual. 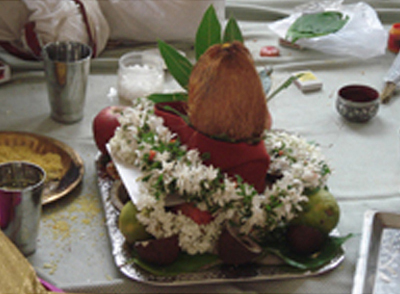 A sweet sherbhat (sweet scented water) is served to all the people in the mantap once this ritual is over. This is yet another ritual which has no Vedic mantras. The toe ring (3 in number for each leg) is worn to the bride by the sister of the groom. .In Ramayana when Rama asks Lakshmana to identify the ornaments of Seetha , he identifies only the Noopura which is worn in the ankles. He tells Rama that the only part of Seetha he has seen is her feet. Though Noopura denotes anklets, some authorities identify it as toe ring and claim that this was an ancient ritual. Possibly this was worn to identify a married woman in ancient times. The groom front then leads the bride by catching her right hand to the mat spread in of the fire facing east. 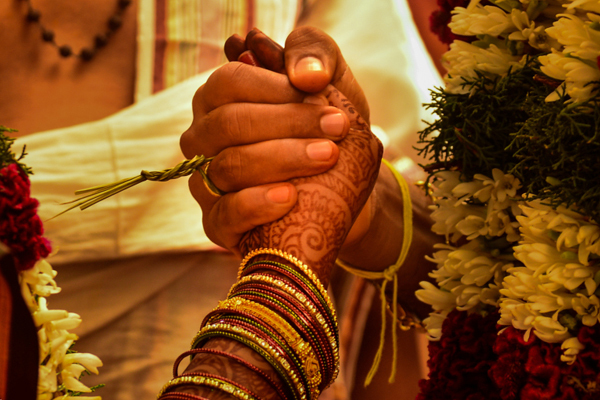 The According to Vedic rites this is the first time when the groom holds the hand of the bride. Nowadays this is the second time, the first being while he leads her to Oonchal (swing). Literally this means "holding of hands. Because this is the first most important Vedic ritual, scholars believe that this should be done during the auspicious time. Normally the bride folds fingers her right hand fingers into a conical form upwards and the groom holds it in his hand folded downwards by surrounding all her fingers. 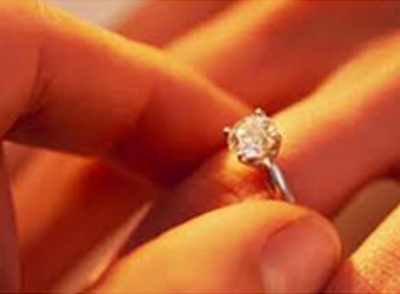 ( One authority says that " If he holds her hand leaving her thumb then they both will have only female children and if he holds only her thumb leaving out the fingers , then they will have only male children).The following prayer is recited by the groom:- Hey maid, I am holding your hand so that you will have several good children and live happily with me till ripe old age. Literally this means the "seven steps". Courts in India have ruled that this is the most important ritual of a Hindu Marriage. They consider that unless this ritual is completed the marriage itself is not over. According to Vedas, once this is over the bride and groom become wife and husband. This ritual consists of the groom taking the right foot of the bride in his left hand and making her take seven steps either in the direction of east. FIRST STEP: Let God MahaVishnu who is spread through out the world, Give you food in plenty. SECOND STEP: Let Him come with you for a second step and give you sufficient strength. THIRD STEP: Let Him come with you for a third step to make you observe all religious rituals. FOURTH STEP: Let Him come along with you for the fourth step to give you pleasures. FIFTH STEP: Let Him be with you when you take the fifth step to give you lot of wealth (cow). SEVENTH STEP: Let him help you in performing Soma Yaga and other prayers when you take the seventh step. YThis is a combined ritual First the husband and wife circle the fire and reach near a stone kept at the north side. The husband holds the thumb of the right leg of the wife by his left hand and places it on a stone. Both of them go near the fire and take their seat. 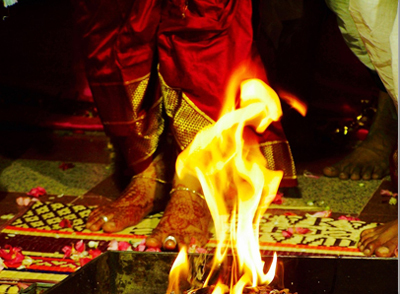 The husband then helps his wife to offer the handful (both palms of the wife are held together .Her brother also takes two hand full of popped rice) of popped rice along with small quantity of ghee given to his wife by her brother to the Agni (fire).Then they circle the fire and repeat this ritual thrice. Though not mentioned in the Vedas, it is a common practice for the husband to give a suitable present to his wife's brother for helping them in this ritual. Normally this should be equal in value to the present given by the bride's family to the groom's sister during Mangalya dharanam for tying the two knots. This means literally blessing. The groom spreads his Uttariya over his shoulders and his wife stands by his side. Than the elders and learned people in the gathering throw Akshathai (meaning that which never ends but in reality rice coloured by turmeric) at the couple with Vedic prayers to the almighty to give him all that is good in life. They pray for his and his wife's betterment. Then the wife and husband visit first the husband's house and then the wife's house .In these houses the female relatives gather and give the husband and wife a spoon each of banana pieces put in milk. Since the husband's house is normally in some other town, the husband and wife are nowadays taken to the place allotted to the groom's party and the husband's relatives give Palum pazhamum there. The lunch normally prepared on the marriage day is a very grand one with umpteen courses. 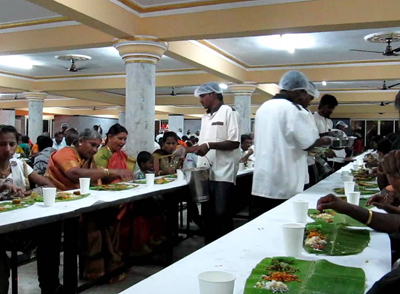 The wife along with her relatives invites the groom and his family for the lunch with a pair of Paruppu Thengai Kutti.Normally a special area is reserved for the lunch of the groom's relatives. In the olden days before each banana leaf of the groom's family guests , they used to keep a lit lamp. The husband and wife sit together for their lunch side by side. Lot of mirth and fun is derived by all concerned when the newly married couples are asked to exchange their half eaten food or when they try to feed each other. This is possibly to make them loose their inhibitions and make them realize that they have some very special rights. This is another ritual of teasing the husband and wife and makes them to get much nearer. The wife along with her friends goes to the husband and invites him for Nalangu.She has to sing a Pathiyam for inviting him (The word must have derived from Padyam which means poem) He agrees and come with all his relatives mainly female and the reply from him is again given in the form of a pathiyam sung by one of his female relatives on his behalf. The groom and his relatives sit on one side and the wife and her relatives sit on the opposite side. The wife stands and then applies Nalangu (a mixture of Oil and Kumkum) on the feet of her husband. She then puts a sandalwood and Kumkum on his forehead. Then she combs him and breaks a chutta appalam (disc like eatable) and puts it over his head. Then she holds a mirror for him to see himself. After this all these rites are performed by the husband to the wife but he would be sitting down. Once this is over the husband takes a coconut and gently rolls it towards his wife. She catches it and rolls it towards him in return. While all these are going on the relatives gathered round sing melodious songs. At the end of the Nalangu, the husband is asked to hold the coconut with one hand and the wife is asked to pry it out using both her hands. Once she succeeds or accepts defeat, the wife holds the coconut with both hands and the husband is asked to pry it using one hand. The relatives tease them a lot.